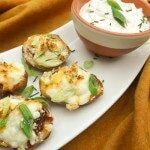 Mini Loaded Potato Skins | Mexican Appetizers and More! 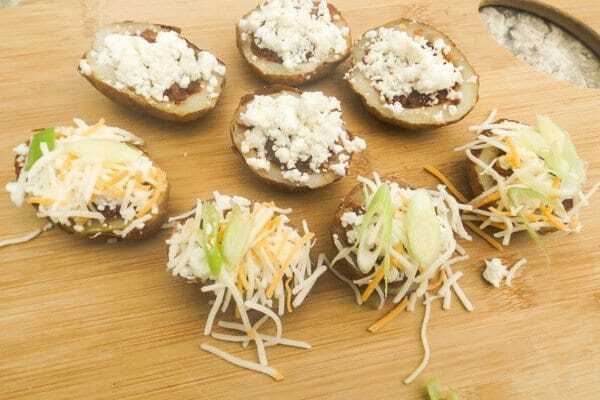 These Mexican Mini Loaded Potato Skins are a great finger food for a gathering, weekend night or anytime! Can be made ahead of time and frozen. Made with chorizo, four cheese mexican blend, queso fresco, scallions and served with sour cream. Your belly will say yum! Today I made these Loaded Potato Skins. Were they good?! Oh yes they were! They were hyper-yummy! Now these weren’t your traditional potato skins though, you know the bacon, chedder cheese, scallions and sour cream kind! I just wanted to make them mexicali style and they came out pretty delish I must say! Chorizo is a type of spicy pork sausage and depending where in the world you are, it is made different. Chorizo is primarily made in Mexico, Spain and Latin America. If the Chorizo is soft (made fresh) it needs to be cooked before eating. And when cooked resembles ground meat in texture. This type of chorizo is usually put in a plastic sleeve casing for sale. Here is an image of the soft chorizo. 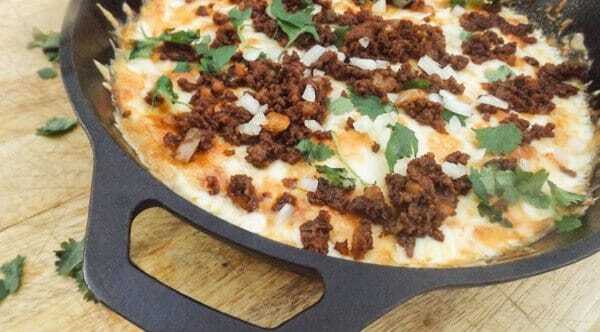 Chorizo can also be cured and eaten without having to cook it. It would be sliced instead. This type of chorizo is cured in natural casings made from animal intestines, usually from a pig. This is an image of cured chorizo. The red and richness in color comes from spicy dried smoked red peppers or smoky paprika. Mexico offers several types of chorizo not just the pork version. They make it with beef, chicken, deer meat, tofu and even kosher versions of it. While there is the famous and very well known red chorizo made from red dried peppers and smokey paprika, there is also the green chorizo made with tomatillos, cilantro and other spices giving it its green color. Chorizo is one of those sausage meats that you can just have with pretty much anything. It’s so versatile. You can add it to eggs, home fries, rice, soups etc…. 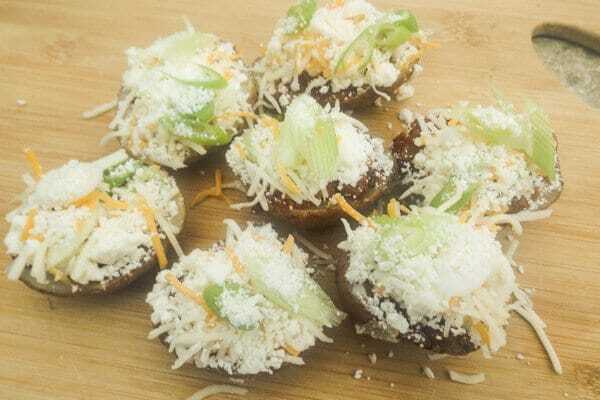 For these loaded potato skins, I used queso fresco. Oueso fresco is a Mexican cheese that can be crumbled up like feta cheese. It can be found usually in the deli cheese section in your supermarket. If you have a hard time finding it, you can order it online or just monterey jack cheese. I also used cotija cheese. Cojita cheese is a hard cheese that originated in the town of Cotija in the Mexican state of Michoacan. It’s kind of like parmesan cheese. Lastly, I used Mexican Four Cheese and this cheese can be found in your local supermarket in the shredded cheeses section. 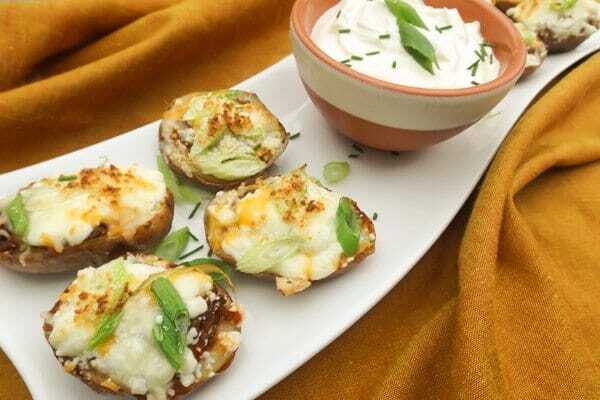 Let’s get t0 these loaded potato skins! Rinse new potatoes and bake at 400° F (205° C) for about 30 minutes until fork tender. Set aside to cool. Cook chorizo with chopped garlic in a skillet over medium heat for about 5 to 10 minutes breaking chorizo apart with spoon. Once cooked, drain excess oil from chorizo through a strainer or colander. Otherwise the potatoes will be too oily. 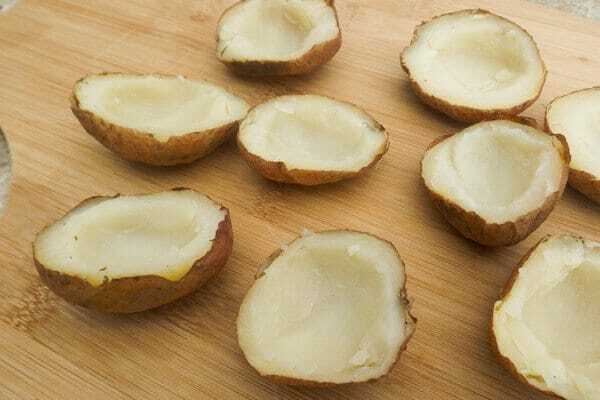 When potatoes are cool enough to handle cut lengthwise and scoop some of the potatoes from each half. Fill potato halves with chorizo mixture. 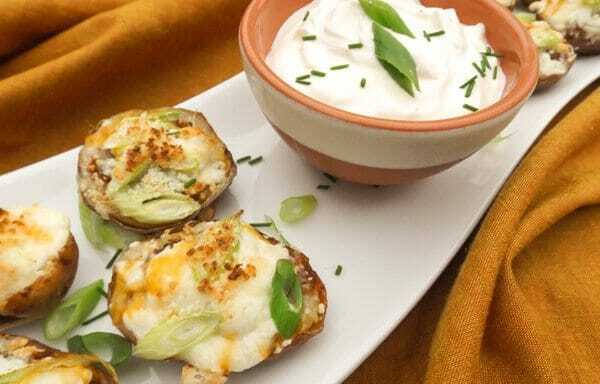 Top each potato with queso fresco, mexican 4 cheese, sprinkle cojita cheese (if using) and top with scallions. Broil for a few minutes until potatoes are warmed through and bubbly golden brown. Serve immediately with sour cream. Great to make ahead of time and refrigerate. Could also freeze for future appetizer or snack. After the potatoes are baked and cooled, cut lengthwise and remove some of the potato from each center to fill with chorizo mixture. Use a melon scooper or teaspoon. After filling with chorizo, add crumbled cheese, mexican 4 cheese, cotija cheese and scallions. Here is what they should look like before placing back into oven to finish cooking. Serve with crema mexicana or sour cream. Delish! 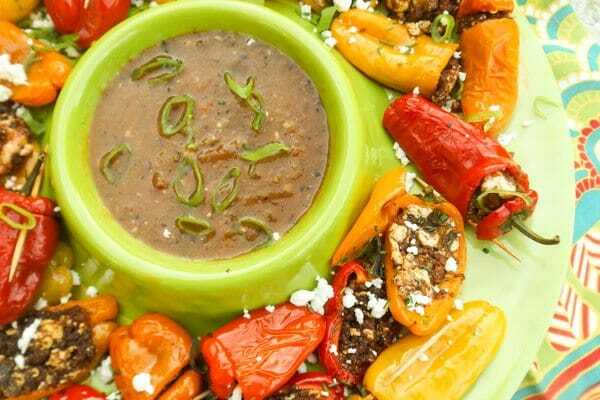 ***For more recipes made with chorizo, you may also like these yummy Mexican appetizers. Will you be making loaded potato skins anytime soon?